The Whitetail Birch Valance features panoramic deer and forest scene in neutral earth tone shades of brown, green and taupe. 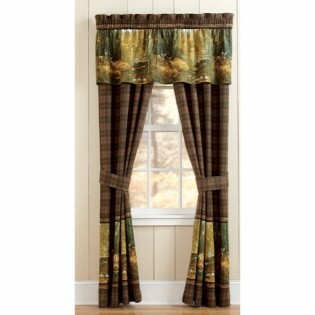 The Whitetail Ridge Rod Pocket Drapes feature a brown plaid and a panoramic deer and forest scene in shades of natural earth tones of brown, green and taupe. The Whitetail Birch Valance features panoramic deer and forest scene in neutral earth tone shades of brown, green and taupe. The Whitetail Ridge Rod Pocket Drapes feature a brown plaid and a panoramic deer and forest scene in shades of natural earth tones of brown, green and taupe.